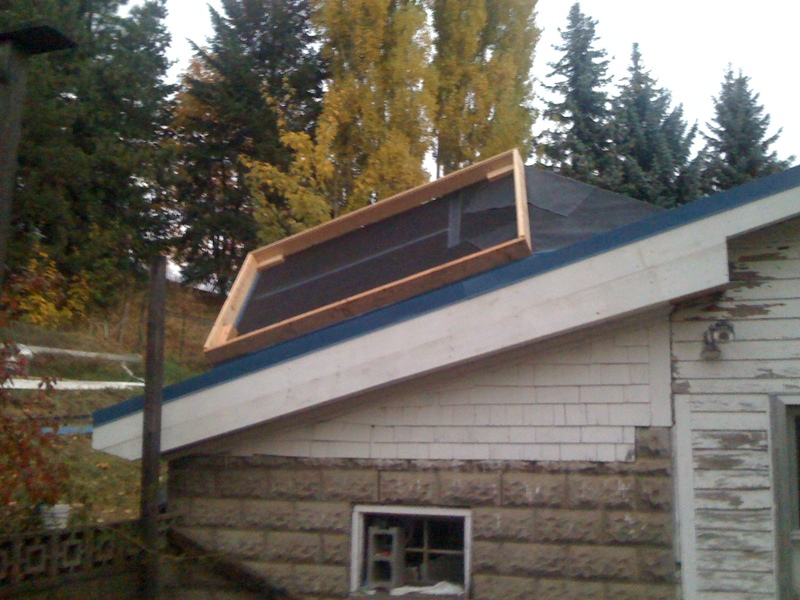 As part of a needed re-roof of my cold cellar I decided to build a place for a solar hot water collector. The idea is to site build the collector using copper pipe with fins attached. The system will be a drain back (that is a pump will run when the temp in the collector is high enough. If the temp falls, or the power fails, the pump stops and the fluid drains out of the collector, protecting it from freezing.) Ideally I will use a solar panel to power the pump. Also, the working fluid in the system is isolated from the city water (good because we have hard water that could lead to buildup in the collector) This means I need a heat exchanger between the solar panel and an old 50 gallon conventional hot water heater that I will use as storage. The collector sits on the surface of a monitor built on the cold cellar roof. The monitor gives me both a north facing skylight in the cold cellar and a way to bring the pipes from the collector directly indoors for ease of access and protection from the elements. Next steps are to finish the remodel and re-organization inside the cold cellar and then start making the insulated cabinet for the HW tank (cold cellar is unheated and cold, but never freezing). This entry was posted on December 5, 2010 at 11:36 am and is filed under Architecture, Solar, Sustainability. You can follow any responses to this entry through the RSS 2.0 feed. You can leave a response, or trackback from your own site.